The architecture, designs, illustration, and artwork of Lewis Wadsworth, Boston, Massachusetts. I did try to emphasize that my interest in this particular software, or in the use of 3D-modeling software in general, was not primarily as a tool for illustration, but as a means of developing a design solution. It took nearly a month for me to acquire a copy of the magazine issue which included the completed article, during which time the software. I was quoted relatively liberally throughout it. In addition, the article two of my project images: a Stormhouse rendering and a quick illustration of an early concept for a residential project (ultimately completed in 2015, to quite a different final design). These were reproduced at sizes slightly larger than your average postage stamp in the printed edition of the magazine. Firstly, can you tell me a little about you, and the work you do please? I have a bachelor’s degree in “visual studies” (an obsolete 1980’s nicety for studio art) from Dartmouth College in New Hampshire, U.S.A., with a general specialization in drawing (1990). For nearly a decade after that I did some illustration work and technical photography, but for the most part I hovered anonymously on the distant fringes of the fine arts world. I was a fairly early convert to digital photography and image manipulation, purchasing my first copy of Adobe Photoshop in 1992. I had always been fascinated by buildings and construction. In the late 90’s I purchased an antique (by U.S. standards) building in Boston, and planned/oversaw its renovation. Despite the best efforts of various well-meaning architects to talk me out of entering their profession, this last experience motivated me to go back to school: after four painful years I received a professional Master of Architecture degree from Yale University in Connecticut (2005). Since my M.Arch., I have worked for firms in the Boston, Massachusetts area designing large institutional buildings (government and university) and master plans for urban redevelopment. Eventually (we all know how this goes) I found myself working on my own, generally as a free-lance illustrator for architecture firms. I have also had a few personal projects win some small honors: I would have called these artistic daydreams or fantasies centered around quasi-architectural concepts, but apparently other architects think of them as theoretical or experimental work of some sort of value to the profession. “Experimental Architecture” does sound more impressive than fantasy, doesn’t it? Four years ago, on a dare from a coworker who expressed some doubts about SketchUp (if not my abilities), I modeled a big chunk of the planet Mars using SketchUp and some data publicly available from NASA (keep in mind that the scope for creativity for interns in architecture firms is practically nil, and I was hopelessly bored). Oddly enough, someone at the Boston Architectural College saw some of the Mars screenshots online, and asked me if I would teach an introductory course for architecture students in the use of the software: “3D Modeling and Illustration.” More recently, because I also have substantial experience in the use of McNeel’s Rhino software, I’ve been teaching a course on 3D modeling and design centered on it. I’m very concerned that 3d modeling technology is generally treated as a form of architectural visualization – as a way to illustrate already-developed architectural projects – as opposed to a nearly unparalleled design tool in itself, and I’ve generally pursued my teaching side-career as a means of remedying that general mistaken tendency, at least for my students. What do you use SketchUp for? First and foremost then, in the fore-mentioned perfect situation, I use it as a design tool. Really… if I have an architectural project in mind, the first thing I do is open up SketchUp on a PC and start modeling stuff. I almost wrote sketching stuff, but really with SketchUp the one is the other. The software’s name is not inappropriate. I’ll create gigabytes of alternative concept models at various levels of detail. I’ll link them as components to site models, or slice and dice them to extract the best bits to copy into some new improved version. 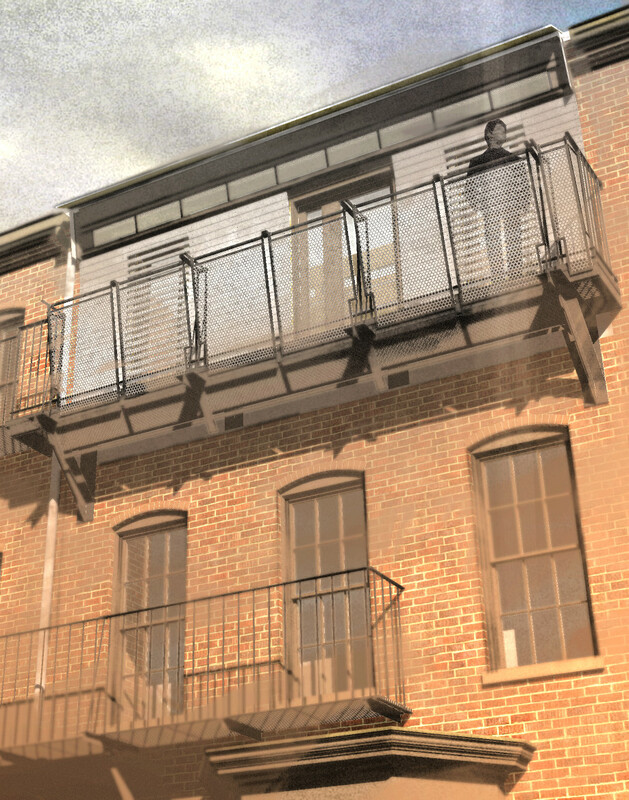 At intervals, I’ll make renderings from the SketchUp models (or conceivably animations – but only once has a client ever asked for an animation in five years!). As necessary, I will export information from SketchUp to use in a formal drawing set drafted in some CAD program. Recently, I’ve begun to believe that the “paper space” program that comes with SketchUp Pro, a.k.a. Google Layout, might be capable generating a drawing set without the use of some third-party CAD program, at least for some sorts of architectural projects. What other software packages do you use, and how does SketchUp fit into that workflow? I use McNeel’s Rhino 4 NURBS modeler with SketchUp quite a bit; I’ve actually been using it longer than I have been using SketchUp. Rhino makes a good companion to the latter, as it is capable of generating the complicated “swoopy” organic shapes that SketchUp’s planar mesh modeling system can’t easily create. I’ll extract the render mesh from the Rhino NURBS model and import it into SketchUp. Or I will import the SketchUp model into Rhino and use it as a mesh or convert it to NURBS, depending upon the situation. Rhino isn’t as good a “sketching” concept development application as SketchUp – the user interface is simply too ponderous, being a kind of extension the idea of the 2D CAD drafting program into 3D space – so I will generally use the NURBS modeler only to refine ideas created in SketchUp, or to create the shapes that simply are too difficult to make in SketchUp alone. Recently, I’ve been trying to find a use for the open-source modeler Blender in my workflow. It’s a trivial matter to export or import from Blender to SketchUp, if you understand a few core concepts, but of course Blender has historically had the most ponderous and eccentric User Interface of any modeler, and they seem to have made it only worse with the new UI currently in beta. The mesh-sculpting, texturing, and rendering capabilities are astonishing in Blender, and it costs nothing as open-source… but it’s just so tedious to use, with the tools you really want to use almost always obscured by the most cryptic arrangement of window organizations. In that regard, you could almost consider it the anti-SketchUp. The indispensable computer tool for me, outside of modeling, is a good image editor. I don’t really do renderings, per se, the way so many make them with ray tracers and GI and biases and so forth – rather, I’ll take a bunch of carefully-styled 2D bitmap exports from SketchUp, layer them, paint stuff in (I have a Wacom tablet, although more often than not I will use a gaming mouse for bitmap painting) and manipulate the hell out of the results until they convey the desired design intent. Photoshop is of course tops for this, and I have almost 18 years experience with it now. I’m using CS4 Extended, and I will probably upgrade to CS5 soon enough on my principal workstation. But because PS has become so expensive, I can only maintain one license now in my single-person “office”… on my notebooks or backup PC’s, I use GIMP or Paint.NET (both of which have all the capabilities, unfortunately, of a late-nineties version of the Adobe product). Before you ask: yes, I do have some rendering plugins for SketchUp, although I really don’t use them that much except to generate a shadow layer to throw into the Photoshop mix. (And you are aware, right, that if I really had to I could make CS4 Extended do that itself?) Right now I have Podium installed in my principal workstation… although I use it so rarely I always have to review the instructions before I attempt something. I do use a relatively few number of Ruby scripts to add some capabilities to SketchUp, but almost no commercial ones. So many Ruby scripts duplicate functionality that is already reliably implemented in Rhino 4, which I own already and with which I have considerable fluency. Google Earth, which integrates nicely with SketchUp, is very useful for conceptual work. It’s simple to import a bit of the virtual globe, terrain and satellite-photo-texture, into SketchUp, if I don’t have enough survey information for a project or I need a site model fast. And as noted above, Google Layout (which ships with the Pro version of SketchUp only) is increasingly useful as paper-space for my SketchUp models and might enable me to dispense with CAD drafting for some projects. (We’ll see – it all depends on what one expects from an architectural drawing set, I suppose.) In the past, I used AutoCAD for hard-line drafting, but I no longer have it installed on my principal workstation; it’s not necessary, given Google Layout and the 2D-drafting capabilities in Rhino 4. Like everyone else in architecture, I have been occasionally caught up in the frenzy over Building Information Modeling… but currently I have stopped upgrading my licenses to Revit and ArchiCAD. Too many interesting design gambits ended were nearly precluded by the BIM software. (A battered or sloping wall is a perfectly legitimate architectural element, for instance, but you couldn’t describe a battered wall with the last version of a certain popular BIM application that I owned!) And anyway, with Dynamic Components in version 7, SketchUp Pro added a certain amount of parametric capabilities – I often wonder why no so few architects seem to take advantage of them. Other programs come and go. I do try to keep an eye out for new things, and every once in a while someone asks me to beta-test a product, or one of my students shares some new obsession with me (one is currently trying to convince me that the new version of Houdini is the best thing since sliced bread, “architecturally speaking”), but I’m generally reluctant to add to my current tool set as long it serves me adequately and runs on my computers. The time spent working through new applications and trying to figure out how to fit them into my design-and-rendering framework is usually time that could be better spent on architectural design. When I’m gone, no one is going to give a damn after all about what version of what computer program I used to produce the design of a building. What does Sketch Up offer that other options do not? Google Mars. It’s so much easier to use that NASA/JPL data when you need to model a vacation home on Ius Chasma. It’s more a question of what SketchUp doesn’t offer: a cryptic user interface and dozens of task-specific tools. SketchUp’s user interface is the opposite of cryptic. There’s so much to be said for it’s simplicity, backed up by a sort of intelligent second-guessing by the application that only presents you with the tools that are applicable to the job at hand. Honestly, the other application I use almost every day for modeling, Rhino, admirable as it is in many ways, must have a couple thousand tools, many of which are subtle variations of other modeling tools. And it has a complex hierarchy of object-types that, one way or another, you must take into consideration if you wish to model something that could conceivably represent a real architectural object in the real world: point-curve-surface-polysurface-solid, with additional oddballs like groups, blocks, and meshes. There are 29 distinct Osnap settings in Rhino, some of which have variations – you need to know and set exactly the correct combination to get the results you want when you attempt to move or otherwise transform an object within your model. With SketchUp, there are only a little over two-dozen primary modeling tools (unless you go mad with installing third-party plugins), and the hierarchy of objects types that must be considered when modeling is considerably simpler: edge-face-group-component. Draw an edge, endpoint to endpoint, with a tool that looks like a pencil; connect 3 or more edges, and bang! you get a surface! Hit that surface with the Push-Pull tool and you turn it into a volume, which is a decent representation of a real-world object even if it is really only a collection of face objects that enclose a space. Draw an edge on a surface in SketchUp and it splits it into two surfaces… no tedious Split or Trim protocols, where you have to carefully specify what cuts what. Push two objects up against each other and they become one object. Or triple-click an object, choose “Group” from that magical right-click Context menu (I say it is magic because it is as if SketchUp somehow knows what you were trying to do and only shows you the options you might need to do it), and you have an object that will not join with other objects in your model. Make something into a component (a.k.a, a block in other programs’ terminology) by simply selecting it and choosing the option from a pop-up context menu. And Osnaps… we don’t need no stinkin’ Osnaps, to hash up a phrase from a Bogart movie: SketchUp has inferences. No complicated arrangement of snap points are required, if you want to move this object so that it touches that object there. The SketchUp inferences will put them together, generally exactly as you had imagined. I can drag this discussion out… in fact, I’ve been paid to teach graduate students in architecture how to use SketchUp, and I typically spend three hours a week of an eight-week half-semester elaborating on how to use SketchUp with architectural design and illustration projects… but the principal techniques are always simple like that. If a SketchUp tool has an option, in most cases you access that option by holding down the SHIFT or CTRL key while you are using that tool. Move an object after pressing CTRL and SketchUp moves a copy of the object for instance. It’s an utterly transparent interface. For a reasonably computer-literate architect (i.e., someone who knows where the power button is, and how to launch an application), it’s not that much more complicated than picking up a set of traditional drawing tools – pencils and trace paper – and working out a design solution by sketching. That’s an important distinction: with almost any 3D modeling package, one can make an illustration (which requires one to already understand, with some precision, what one is attempting to model and then render); with SketchUp, I can (and I will keep emphasizing this) work out a design (where I do not start with a preconceived notion of the building I am attempting to model – where I don’t have solutions to the varying requirements posed in the project brief beforehand). How long have you used it? Why/when did you start using it? I started using SketchUp in 2002, while I was in graduate school. I went to an architecture school where the vast majority of students, with few exceptions such as myself, started the program with considerable experience in the typical CAD drafting programs used in architectural firms. Their posters and prints looked professional, and the instructors would immediately move to talking about the designs as opposed to critiquing the method in which were they were described. I was desperate to level that playing field, or even leapfrog my fellow students’ abilities to convey design intent. I had already spent my precious vacation time getting a certificate in Rhino use, but when I saw someone at the school using SketchUp 1 on a notebook computer (he had been given a copy by a former employer), I knew that this sort of fluidity would save my graduate school career. I immediately purchased a copy online (the application had just gone to version 2), downloaded it, spent about 6 hours working through the help-file exercises, and then applied it to my current projects. By 2003, one of my more casual design studio projects had been described in @Last’s SketchUpDate newsletter (@Last Software was the original producer of SketchUp, before it was assimilated into the Googleplex), and I found myself receiving job offers from architecture firms on 3 continents (none of which, unfortunately, I had time to accept, I should add). And in 2004 an image from one of my design studio projects appeared with a review of SketchUp 4 in the magazine Architectural Record. SketchUp Pro version 7. The free “non-pro” version does not include Google Layout, and no longer even imports DWG or DXF CAD files, which (who would guess?) makes it unsuitable for professional work. Are there any features you wish it had? SketchUp was the first program I had used that had real-time shadows – in other words, you could take lighting into consideration while developing your design, and instantly see the results in the application window. But they haven’t really updated the function since I first learned the program, eight years ago. The shadows and apparent lighting only are affected by sun position, and there is no way without using various commercial plugins or rendering packages to study or render interior or artificial lighting. Other programs now do allow this, though… even the public beta of Rhino 5 permits “real time” shadows, in the modeling viewport, from multiple light sources. I wish Google would deal with this, or dump the whole “real time” shadow idea if favor of a quick rendering system that would generate shadows from multiple light sources. I really don’t need reflections… ray-tracing, or global illumination, or anything like that. I just want to be able to place some light sources in my SketchUp model to see how the lighting affects my design and where the shadows fall. I should add that I can use the reasonably-priced commercial SketchUp plugin Podium for this… but I don’t see why such very basic functionality can’t be part of the program itself, when even most open-source modelers include a decent scan-line rendering system. There’s not much else I currently find irritating about the application. Of course, I also own a license to Rhino, which enables me to create “organic” shapes for my model easily, and then bring them into SketchUp as described previously. I know that quite a few people really wish that SketchUp itself had a more robust system for modeling items that are not principally composed of planar forms, and there are plugins one can buy that permit sub-surface modeling or similar effects… but once again, something so basic and so demanded by the customers should be incorporated into the base application. What rendering package do you use? And how does that integrate into your workflow? Please also see the answer to “the other software packages” question, above. As noted, I really don’t use a rendering package of any sort often, if by rendering package you mean something that provides ray-tracing or one of its descendant technologies. SketchUp currently exports 2D graphics that exactly reflect the current drawing Style applied to the model–in other words, exactly what you see in the model screen, the way it is set to display. From a particular saved camera view, I will export several different images of the model with different Styles applied to each: one might be a no-material, shadow-and-shading-only image; one might be material with textures and no shading; one might be a hidden-line rendering, etc. I will place these varied images as separate layers in Photoshop (or GIMP, or the equivalent) and using masks, filters, smart objects, and the full panoply of image manipulation techniques control exactly what “shows through” from each layer to create a composite image that conveys the design intent appropriately. Most of the time, I am not aiming at “photorealism” in rendering, at all. I might aim for a project image that looks like a Wyeth tempera painting, or one with other non-modeled imagery collaged with the model-generated forms, or even something that looks like it was drawn with magic marker on pieces of paper taped together. When I worked for other architects, I found that clients could be intimidated by utterly realistic images… they became agitated over carpet colors or curtain patterns, and couldn’t see past such triviality to the more important design considerations which we wished them to consider. That doesn’t seem to happen with the more “painterly” sort of images. And of course, if someone really eventually does need me to indicate the curtain pattern, I can ultimately produce a representation of that… these days, I would probably export the SketchUp model to Blender 2.49b for a more photo-realistic rendering. I have the opinion that expressive, “unrealistic” illustration idioms are more appropriate for architectural designs that are not necessarily meant to be built (made “real”) anytime soon. Also as noted above, since I work in architecture the rendering is not the end of the process, often enough: if all goes well, I may need a “hard-line” drawing set. I used to use AutoCAD for that, but then Rhino picked up some 2D drafting capabilities. And now Google Layout (which ships with SketchUp Pro) seems like it will work for this (I’m still testing this idea out), and Layout will actually maintain a link with the project model if I need to quickly change something in the SketchUp file and see it update in the 2D drawing set. Now, could you tell me in detail about using it for a recent project please? 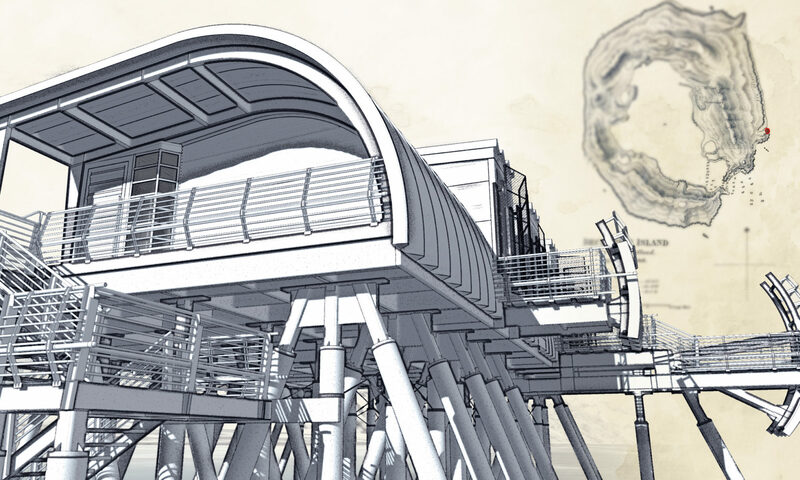 I’ll talk about a project that won the BSA Unbuilt Architecture Award in 2009 because (unlike some more recent work) it was modeled fairly exclusively using SketchUp, without resort to other 3D modeling applications for any particular elements. This is an example of experimental architecture (a cappricio, if you want to use the term from architectural centuries past when apparently this sort of project was less controversial), something I developed for a variety of reasons but without a specific client or commission. As this article is primarily concerned with the use of SketchUp by architects, I’ll leave the discussion of why an example of experimental architecture might seem like an admirable or important project to some architects – and a despicable fantasy or daydream to some with different views of what constitutes “architecture” – to other publications and websites. The project certainly has appeared in a number of them. To summarize then, this is a two-room, hybrid steel-framed/structural-steel arch building on fiberglass-reinforced pilings on a particular beach of Deception Island, off the coast of Antarctica. I call this the Stormhouse, and – if you must know – it’s where “I” (in the person of my own imaginary client) would go to wait for the end of the world. I’ve never been to Deception Island, although quite a few cruise-ship tourists have stopped by to look at penguins apparently. I could only find some dated surveys of the site, so the immediate local terrain you see in the rendering is in fact largely imported from Google Earth into SketchUp. The mountains and the rocky prominence behind the beach, that appear in the renderings, were largely painted by me as bitmap images using Photoshop, based on my interpretation of various “tourist snapshots” and other images I could find easily on the Web. I applied these painted images to flat, trimmed vertical faces, which I arranged so that from any reasonable perspective of the Stormhouse that included a land view they would simulate the actual geological situation with considerably fewer polygons than fully-modeled terrain. Various major chunks of this project were created separate in SketchUp files, which were loaded as linked components into a master file that contained saved camera views and display Styles that I developed or discovered during the modeling process. Even though this is not a “real” project, the building is modeled quite comprehensively, in many places with parametric Dynamic Components that will adjust themselves based on size and other requirements (I wrote the “DC’s” myself). The structural steel frame is actually there, underneath the galvalume roof and siding, and I even indicated flashing details in many locations. Normally, when one undertakes to illustrate an already-resolved design, one only models what will be visible and important in the renderings. But I designed this building in SketchUp, and to understand to my own satisfaction how the building would appear outwardly, I had to understand how the Stormhouse would be assembled and support itself. So I modeled the structure, and then thought about how the various “skin” elements would attach to it, and consulted manufacturer sites and product descriptions, and constantly sent the whole concept through the “design feedback loop” that architects habitually apply when developing schemes for real structures: I would backtrack from an outward change in the appearance of the building through the structural or material requirements necessary to create that change, and then go forward from that point to see what implication the structural or material change might have on other parts of the building. With SketchUp I could of course do this in three-dimensions, with some reliability. If a change in size to a steel member made it too deep, for instance, to fit within the space between roof and finished ceiling, I could see the problem immediately in the model, and then I could proceed to come up with a better alternative. In fact, if I needed to do so right now, I could generate documents that would conform to the general requirements for a late DD-phase drawing set. Without too much more work on the project, I could even begin to produce a CD set and schedules – there’s that much detail in the model. The manufacturer of the structural-steel arch system I chose for the roofing system actually placed images of the Stormhouse on their corporate blog as an example of a potential creative use of their product! The renderings were produced with 2D graphic exports from SketchUp that were masked and manipulated in Adobe Photoshop CS3 and CS4. Each graphic export, which reflected a particular display Style applied to the model, was layered over other images made from the same camera position, or else it was used to create a Photoshop alpha channel that would allow me to limit image manipulation to a particular area in the composite image. By the time I had assembled and modified the various exported graphics, the layered Photoshop files had ballooned in file-size to over a half-gigabyte with a minimum of two-dozen layers each. Some particular graphic output (the shadows and lighting) for the interior rendering were produced using a commercial plugin for SketchUp, called LightUp, which in theory provides the ability set multiple light sources, other than just the sun, each with its own real-time shadows. (In fact, I haven’t used LightUp since… on my computer at the time it seemed difficult to control, slow, and unstable.) The side-view perspective was produced with additional output from Piranesi 5, an application supposedly aimed at making it easier to create expressive non-photorealistic renderings. (However, after using it on this rendering I discovered I really didn’t need Piranesi… I could do much the same thing with other applications, notably Photoshop, faster and more reliably without having to deal with a yet another cryptic user interface). Much was made of the images and their graphic idiom. An early version of a Stormhouse rendering was incorporated into the title block of an issue of the American Institute of Architects AIArchitect online newsletter in 2008. Architects wrote me that it reminded them of their favorite computer game, or of classic comic books. I find that very flattering, given that I have that background in art and drawing. And I have a good sense for how much talent and effort is required for work in those areas. In fact, the jurors at for the BSA Unbuilt Architecture Awards compared the ensemble of Stormhouse renderings to just that: a graphic novel.